Planned and under construction dams in the Niger delta - Source: Living on the Edge: Wetlands and Birds in a Changing Sahel.—L. Zwarts, R. Bijlsma, J. van der Kamp, and E. Wymenga. 2009. KNNV Publishing, Zeist, Netherlands. 564 pp. The Inner Niger Delta in Mali is one of Africa’s largest wetlands. The Fomi dam in Guinea would produce electricity and water for mining and large scale agriculture under the name of poverty reduction. World Bank still selling old flawed discourses. This is a transboundary conflict. The Inner Niger Delta in Mali is one of Africa’s largest wetlands bordering the Sahara Desert. It hosts millions of migratory birds coming down to Africa from Europe, in a green rich biodiversity hotspot. The delta also serves as a lifeline for between one and two million people who depend on its fisheries, agriculture and pasturelands. The unique ecosystems of the Inner Niger Delta are in turn sustained by the beneficial annual flooding of the Niger River that inundates up to 30,000 km2 – an area the size of Belgium. However, the region is targeted by large scale water diversion plans. The projects include a 102 megawatt (MW) hydropower dam at Niandan river in Fomi in Guinea, a 25 MW hydropower plant in Toussa, Mali, and the 565 MW Kandadji dam in Niger. They are all meant to boost hydro-electricity and irrigation, reduce desertification and flooding, and improve economic activities across the region. The Fomi dam is planned to be built near the river’s source in neighboring Guinea and is funded by the World Bank, under the Niger River Basin Management Project (NRBMP) and through its International Development Association fund. From the same fund, the Bank plans to finance a new generation of controversial mega-dams, including the gigantic Inga 3 Dam on the Congo River. The WB approved in Jan 2015 a budget of US$7.5 million for NRBMP, half of which would cover activities to build support for Fomi . The Fomi Dam has long been a priority for the government of Guinea, which wants to harness the Niger’s flows to generate hydropower. Previous plans to build it collapsed in part over objections from Mali given the magnitude of impacts downstream. Three Ramsar sites, a total of 1,620 km2 have been declared in the Inner Niger Delta; Lac Horo, Lac Debo, and the Séri floodplain. But the delta is largely unprotected and at the same time fishing and farming in the delta is vital to the livelihoods of the people of Mali. The World Bank is now helping revive the project, with the new Fomi scheme being billed as a “multipurpose project.” According to the WB documentation, "Seven of the Basin countries are among the 20 poorest countries in the world, all of which have a predominantly rural population relying on rain-fed agriculture, pastoralism or other natural resource based livelihoods. [...] Water infrastructure, such as hydropower plants, irrigation schemes and navigation facilities, and storage development, can significantly contribute to economic growth and poverty reduction, and build resilience against extreme weather, such as droughts and floods.". 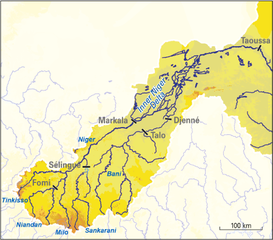 In addition to generating power in Guinea, Fomi is now meant to double lands under cultivation in the Office du Niger, the Malian quasi-public irrigation scheme of colonial times that yields the bulk of the country’s rice and sugarcane. The Fomi Dam is meant to ensure year-round irrigation in the Office du Niger by withholding flows during the rainy season and spacing releases throughout the year. According to International Rivers (IR), large tracts of land in the Office du Niger have already been allocated to foreign investors, amid allegations that smaller producers have been pushed off the land. The two largest projects provide water for the South African sugar giant Illovo and a Chinese state enterprise. However, IR warns that: "Construction may be years off, but the Bank is laying the groundwork by bankrolling requisite studies that examine environmental impacts and technical feasibility, as well as resettlement planning for the estimated 45,000 Guineans who would have to be relocated to make way for the dam’s massive reservoir." Also hydrologists have warned that the inner Niger delta could soon run almost completely dry every fourth year. In fact, massive engineering works on the Niger river, West Africa’s largest river, are set to turn the delta into a desiccated area. According to the head of Wetland International, Jane Madgwick, the result would be a “human catastrophe as vicious and shameful as the drainage of the Aral Sea” in central Asia by Soviet engineers . During the World Water Forum in Marseille in 2012, studies were presented on the impact of Fomi dam in the territory. Results have shown how the delta varies in size from year to year, depending on rainfall in the region. According to the hydrologist Leo Zwarts of a Dutch consultancy, during the last major drought in 1984, three-quarters of it dried out, fishing failed, cattle died and most of the people fled . His study warns that the dam and irrigation schemes would make a disaster like the 1984 drought likely on average every four years. While increasing Mali’s production of commercial crops, the projects would cause extreme poverty and force more than a million people into migration, says Madgwick. The Fomi dam, which has funding lined up but no start date, is designed to capture much of the river’s wet season flow, and would prevent the annual flooding of the wetland. IR has put it crystal clear: "Fomi would have considerable impacts on the Inner Niger Delta and those who depend on it. We have seen time and again that agreements intended to guarantee downstream flows are rarely respected in the face of strong economic incentives to recoup project costs and turn a profit. If the Fomi Dam is indeed built, this will most likely spell ecological disaster for the Inner Niger Delta. By leading the process to bring Fomi forward, the World Bank will bear responsibility for a scheme that is fundamentally flawed". Compensation will also remain a key issue for the Fomi project. Even governmental actors admit that expropriation and compensation processes lack of clarity and transparency ; even if some initiatives are being put at place to improve this, facts in Western Africa (see Akossombo project in Ghana) have shown that things are too complex to be fixed with some "more participation" or "better compensation" discourses. Project Details Fomi is to be built on the Niandan River at the city of Fomi, with an installed capacity of 102 MW producing 402 GWh annually. The project's 42-meter-tall embankment dam would create a reservoir of 507 square kilometers providing irrigation to 80,000 hectares of farmland in Guinea and Mali. The project also would include 800 kilometers of transmission lines. Other water diversion schemes are also projected in the Niger basin: The Taoussa dam in Mali - estimated to cost $38 million - is slated to generate electricity for Burkina Faso and Niger, and could eventually provide irrigation for nearly 140,000 hectares. The largest of the three dams in terms of power generated, Kandadji in Niger, will cost around $236 million. Funding for the three dams is being provided primarily by the World Bank and the African Development Bank. Other Rich bird life in Mali Inner Niger River Delta, including Ramsar sites. Development of Alternatives Other small scale renewable energy schemes like small solar are proved to be much more affective to ensure electricity to rural areas. EJOs argue these large schemes are only meant to ensure profiting by land exprpriations and export oriented agriculture and mining industries. Living on the Edge: Wetlands and Birds in a Changing Sahel.—L. Zwarts, R. Bijlsma, J. van der Kamp, and E. Wymenga. 2009. KNNV Publishing, Zeist, Netherlands. 564 pp. Liersch, S., Cools, J., Kone, B., Koch, H., Diallo, M., Reinhardt, J., ... & Hattermann, F. F. (2013). Vulnerability of rice production in the Inner Niger Delta to water resources management under climate variability and change. Environmental science & policy, 34, 18-33. 18 December 2014. European Investment Bank invests in Guinea hydroelectric power (including Fomi dam). Planned and under construction dams in the Niger delta Source: Living on the Edge: Wetlands and Birds in a Changing Sahel.—L. Zwarts, R. Bijlsma, J. van der Kamp, and E. Wymenga. 2009. KNNV Publishing, Zeist, Netherlands. 564 pp.